This project was funded in part by the Oregon Transportation Research and Education Consortium (OTREC) and the Oregon Department of Transportation. Since the 1980s, homelessness has become an increasingly visible and seemingly intransigent part of American society. It affects not only those who experience it directly, as a condition in their own lives, but also a broad spectrum of interests that deal with its effects. One such interest is owners and managers of public land, where homeless individuals commonly seek refuge, sometimes forming communities. Although their business may be transportation, natural resources management, recreation or some other public service, managers of public land are called upon to deal with this complex environmental, legal and human problem. 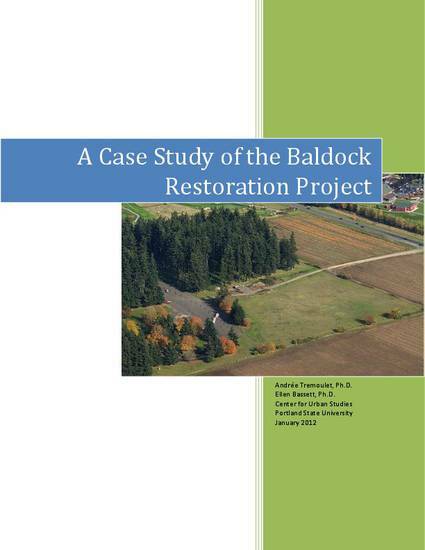 This is a case study of the Baldock Restoration Project, in which a team of people from the travel, transportation, law enforcement and social services professions came together to help homeless individuals leave their long-standing community located in an Oregon highway rest area, thus restoring the rest area to its original function. This case study is part of a larger project to analyze ways in which transportation agencies address the challenge of homeless encampments on public rights of way. A best practices guide of potential strategies and interventions for a variety of contexts will also be prepared. The case study was prepared over a six-month period that began approximately one year after the conclusion of the project. Primary sources included semi-structured interviews with eleven key informants who were part of the team working on the project and three former members of the homeless community. Documentary sources included media accounts, meeting minutes and reports written by key informants. Sources were triangulated to promote accuracy. This is the final report. This is a state and local government work, and is not subject to copyright in the United States.